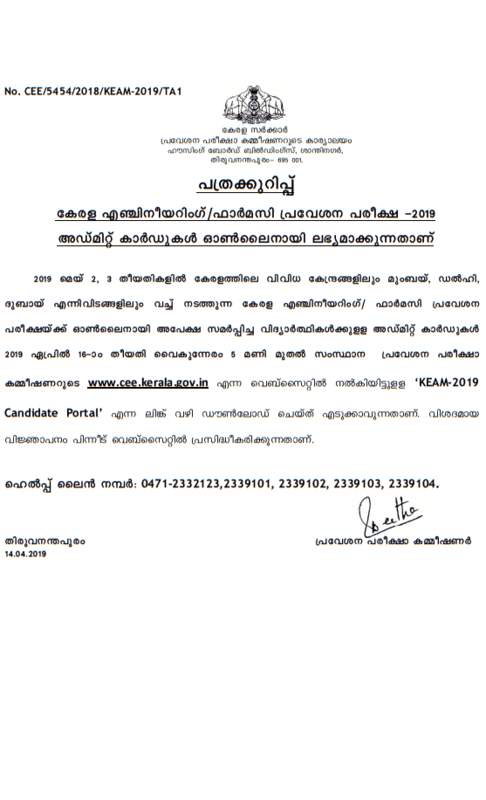 KEAM Admit Card 2019 Hall Ticket: Commissioner of Entrance Examination (CEE) Kerala will conduct the KEAM 2019 on 2nd and 3rd May 2019 respectively for Paper I and Paper II. KEAM 2019 exam will be conducted in offline mode. To get the entry in the exam center to take the KEAM 2019 exam the applicant will need their KEAM Admit Card. So Commissioner of Entrance Examination (CEE) Kerala will release KEAM Hall Ticket online for the applicants. Latest 16th April 2019: KEAM Admit Card 2019 will be released today on the official website of CEE Kerala. All candidates will be able to download their admit card from the below link. If you have applied to appear in KEAM 2019 then all you need to do it visit the official website and download your admit card by following few steps. In this article, candidates who have applied for KEAM 2019 can know the steps to download the KEAM 2019 admit card, direct link to download the Hall ticket to take the exam and other important information related to KEAM 2019. KEAM is Kerala Engineering, Architecture, Medical Entrance Examination. This exam is conducted by Commissioner of Entrance Examination (CEE) in order to offer admission to the applicants in the reputed colleges of the state. The exam will be conducted on 3rd May 2019 and its result will be announced on 25th May 2019. After the declaration of result, the counseling process will start. In this post, the candidate will get the information on KEAM 2019 to admit card, exam pattern and other important exam day instructions. Before moving further, first, let’s have a quick look at the important dates of KEAM 2019 exam. Applicants who have applied for KEAM 2019 can download the admit card from the official website of the Commissioner of Entrance Examination (CEE) Kerala only. Candidates will have to download it and keep its print out with them. Applicants will not get the admit card through the post at their doorstep. Candidates will also not get any mail related the release date of admit card or any link to download admit card. As it is an essential document to get the entry in the exam room so the students need to be careful about KEAM admit card. It is also expected from the students that they will cross check all the information mentioned on KEAM admit card. In case of any issue or mistake, candidates can get it solved by contacting the exam conducting authority. Now let’s know how to download the KEAM Admit Card 2019 from the website of CEE Kerala. The exam conducting authority find it easier to upload the admit card on their website instead of sending it through the post. The reason behind this is, the website can be accessed from anywhere but admit card by post may get lost sometimes. To download the admit card from the website, one should know all the steps to download it. Follow the below mentioned steps and download you KEAM 2019 admit card. On the home page, you will get a link ‘KEAM admit card 2019’, click on it. You click will take you to next page where you will have to type KEAM 2019 application number, password and security code. Now click on the enter button. Now, your admit card is on your screen. Check all the details mentioned on it, if everything is fine and easy to read then take a print out of your KEAM 2019 Admit Card. So that’s how you can download your admit card in 5 steps only. Make sure you will enter all the correct details of your application number, password and security code else the system will not show your ad it card. As we have mentioned above, your admit card is an important document so all the information mentioned on your admit card should be right. You will find the following information on your admit card. If any of the information mentioned above is not correct then candidate’s can contact to KEAM help number. The contact number of KEAM Helpline is as follows; 0471-2339101, 2339102, 2339103, 2339104. Original Photo ID card proof such as Aadhar Card, Voter Id Card, Pan Card, Bank Passbook (with photograph), Driving Licence or any other government approved ID card with applicant’s photo on it. Here are the important points about the KEAM exam pattern 2019. Have a look at them and prepare for your entrance exam accordingly. In the KEAM exam, students will have to answer multiple choice questions. Every question will have 5 options and out of them, only one will be correct. Questions asked in KEAM 2019 will be taken from physics, chemistry, and Mathematics. Duration of KEAM 2019 examination will be 150 minutes. Candidate will score 4 marks for each right answer. KEAM has the procedure of negative marking and with every wrong answer, the candidate will lose 1 mark. Carrying a mobile phone, calculator or any other electronic device is not allowed in the exam center. If any candidates found with any of prohibited device in the classroom then he can be disqualified to appear in the exam. No candidate will get the entry in the examination hall without the Hall ticket. The hall ticket should be in fine condition and all the content on the admit card should be readable. Candidates will have to be punctual to reach their exam center. Note that applicants will not be permitted to enter the examination hall 30 minutes after the commencement of the examination. Candidate will also not be allowed to leave the exam room before completion of the exam duration. As KEAM 2019 exam will be conducted in offline mode so candidates should carry a ballpoint pen (black or blue ink) and a cardboard/clipboard. Items such as Pencil, Eraser, Correction Fluid, Logarithm Table and any notebook will also not allowed in the exam room. Hope this article has offered you the desired information on KEAM 2019 admit card and exam. For any further query, write to us in the comment box below.